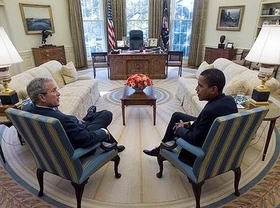 President Bush and President-elect Obama met in the Oval Office on Nov. 10. WASHINGTON -- The Bush administration has decided to pass on its promised decision on new fuel economy standards to the Obama administration. In a statement this morning, the U.S. Department of Transportation said it will not issue final rules for fuel economy standards for the 2011-15 model years as planned. The recent financial difficulties of the automobile industry will require the next administration to conduct a thorough review of matters affecting the industry, including how to effectively implement a new energy law requiring tougher standards, the statement said without attributing it to any individual. The energy law, enacted in December 2007, requires standards to go up 40 percent by 2020 to a fleetwide average of at least 35 mpg. The standards for 2009 are 27.5 mpg for cars and 23.1 mpg for light trucks. The National Highway Traffic Safety Administration proposed a rule for the 2011-15 model years, raising standards by about 25 percent by the end of that period at an estimated cost of about $47 billion to the industry. The Bush administration had promised a final rule by the end of 2008. But that was before the economic downturn reached crisis proportions for the automobile industry, necessitating federal loans to General Motors and Chrysler LLC to keep them afloat. Automakers are not happy about the delay because they need certainty in rule-making for their product planning, according to the Alliance of Automobile Manufacturers, representing the Detroit 3, Toyota, Volkswagen and six other automakers. "We look forward to working with the Obama administration to provide them with any information they need to complete this rule-making. Manufacturers share the goal of enhancing energy security and reducing greenhouse gas emissions," said alliance spokesman Charles Territo. Federal law requires NHTSA to give automakers at least 18 months lead time before imposing higher standards under the corporate average fuel economy program, or CAFE. So time remains for the Obama administration to impose higher standards for the 2011 model year -- which, under the CAFE program, begins Oct. 1, 2010. The deadline for a final rule would be April 1. President-elect Barack Obama has nominated former Rep. Ray LaHood, R-Ill., as the next secretary of transportation, who oversees NHTSA.